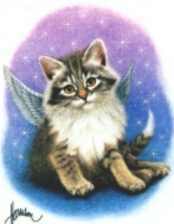 For those of us who have lost our beloved kitties in the past and for Terri at Alexia's Books and Such and author C. W. Gortner (his blog, Historical Boys) who both recently lost their cats (read their posts by clicking their blog titles). This poem has helped me a few times in recent years. Thanks for hosting such a lovely meme. Cat lovers understand other cat lovers. Beautiful & True. I have used this poem many times. Thanks for posting it. Aww, I didn't know Terri just lost her cat. I feel so bad. It is a hard one to lose our four-legged friends. Thanks for sharing this.